If you have a dead battery, obviously you can’t drive to the mechanic shop. You can call WrenchPatrol mobile mechanics to install a car battery for you. Good quality car batteries cost $85 to $150 plus installation, truck batteries can be $110 to $190 since they are usually bigger. Some cars require more than one battery. 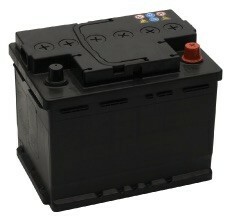 In our area, most car batteries come with a 24 to 30 month warranty. Aside from the obvious, what does a car battery do? The 12V car battery is an often neglected, but essential piece of equipment in any modern road vehicle with a combustion engine. Often referred to as the SLI-battery it is responsible for Starting the vehicle, initially supplying power for the Lights and the Ignition system. This is why a weak battery can prevent a car that would otherwise produce its own power from starting. In operation, the car battery provides all of the initial electrical power to the vehicle until the engine gets running, at which point the engine’s alternator begins to spin and recharges battery. Because the power created by the spinning alternator can be unstable, the vehible battery also serves as a repository for electrical power, storing it and delivering it to vehicle systems at a stable rate/level. Typical car battery construction consists of 6 individual cells of lead plates, submerged in a bath of strong sulfuric acid. This is why vehicle batteries have such heft and must be handled and recycled with proper care by professionals. Each cell provides approximately 2.1 volts of power, which in turn means that the battery often referred to as 12V is actual 12.6V. On batteries that have removable service caps, the electrolyte (acid solution) should be checked for level and condition (including specific gravity). Terminals, clamps, vents and cables should also be thoroughly checked for wear and corrosion as part of any inspection or replacement. Modern battery testers are specialized tools that are capable of checking remaining battery life and deterioration, allowing for preventative maintenance. i.e. Replacing the battery before it leaves you stranded. Replacing the vehicle battery may involve not only resetting convenience features such as the clock and radio, but also safety systems such as steering angle sensors, acceleration sensors and the like. Batteries contain hazardous chemicals and must be handled and disposed of properly to avoid chemical burns and hazardous waste. More and more battery replacement is becoming an operation best left to the professionals.